For the past three years, when I come to Paris, I rent a flat in the vicinity of the Marais, because the possibilities for eating in are nearly as attractive as those for eating out. Guidebooks, magazines, and food guides usually point visitors in the direction of various streets around the city known for their food store — Rue Mouffetard, rue Cler, and rue Cadet come to mind. I tend to stick to less obvious choices. In the two blocks of rue Rambuteau between the Centre Pompidou and rue des Archives and the three blocks rue de la Bretagne east of rue de Temple both contain good shops for buying locally made products and not-so-locally made products. Wonderful cheese, bread, and paté are well represented on these streets. Bread forms the foundation of any meal worth making here. Unfortunately, I do not know the name of the boulangerie I prefer on Rambuteau. Nor is the photo I’ve provided very helpful, I admit. But if you stand on the northwest corner of rue du Temple and Rambuteau and turn into the first bread store as you head west on the north side of the street, you will have found it. Over the three years I’ve been shopping here, I have come to prefer the bread in this boulangerie much more than the others on this street. P.S. However, if you want to experience greatness in bread and croissants, convince yourself to walk an extra 10-15 mins. east on rue Rambuteau to the boulangerie Au Levain du Marais. Bear in mind that Rambuteau turns into rue des Francs-bourgeois. 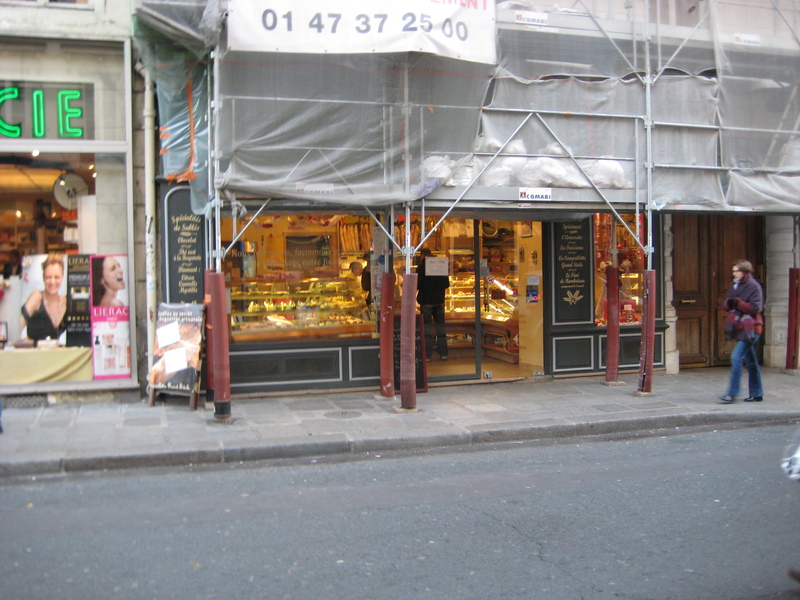 When you come to the intersection of rue Tournelles, turn left, and it is the red-painted boulangerie a block or so north on the right side. Steven Kaplan, whom even the French acknowledge as the man who knows more about French bread than anyone else, rated this boulangerie one of the two highest-rated bakeries in the city. Do not leave Paris without trying one of their croissants!